Jackfruit known as world's largest fruit is a tropical fruit which grows mainly in South-east Asia. It is very much liked by the people due to it's delicious taste and aroma. The tree grows very tall and is evergreen. But the fruit is seasonal. The fruit as you can see in the videos and photos, grows very big. 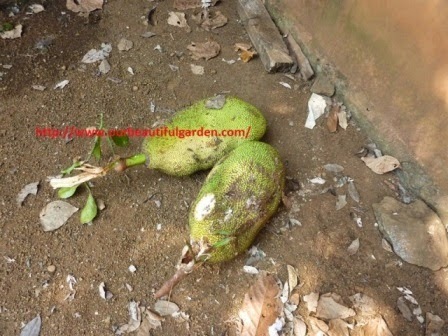 Now a days there are lot of varieties of jackfruit trees available which does not grow much tall so that we can pluck the fruit easily. In Kerala ( a state in India ) the fruit before ripening is used to make a very popular and delicious dish called chakka puzhukku. One average sized fruit would be enough to make chakka puzhukku for a small family. In Kerala Jack fruit ( called Chakka ) is mainly divided into two types - Varikka Chakka and Koozha Chakka. The flesh of ripen Varikka Chakka is harder compared to ripen Koozha Chakka. Jackfruit is also used in Kerala to make different types of fries which can be stored for a long time. Another food in Kerala made from Jack Fruit is Chakka Varatiyathu which looks like a jam which is very tasty. is a white sticky fluid which comes out. You can wipe it of f with some paper or cloth. If by chance it sticks on your body or cloth you can remove the white jack fruit fluid by applying some oil. In Kerala we use Cocunut oil which we use to cook foods to remove the white sticky jackfruit fluid if it sticks on the body or cloth. So I hope the same type of oils will work as well. The sweet yellow tasty flesh has a very good aroma. Anyone would love to it this fruit and will become a fan if you eat it once. Note -Different varieties have different tastes. Each and every flesh contains a seed which should be removed before eating. The seed is also used to make variety dishes. Almost all parts of jackfruit are usable ! Yes the outer rind can be given to your cows. The cows loves it very much. If you don't have cows you can use it make bio-fertilizer. This article contained great knowledge regarding Jack fruit.I dint know about it in that detail because these fruit is not available in my country.